Combine HTML to PDF with ease and smile! You are here: CoolUtils > PDF Combine Pro > Combine HTML to PDF with ease and smile! Latest versions of Microsoft Word have a standard feature for exporting a document to PDF format. However, there is no ability to combine a few Doc files to a single PDF document. This can be done manually: first copy-paste all Doc files into one document and export it to PDF. If saving time is of high priority for you, it is better to use PDF Combine Pro. This program is able to combine several Word files to one multi-page PDF in a few seconds. Ability to combine files of different types (Doc, TXT, HTML, etc.). 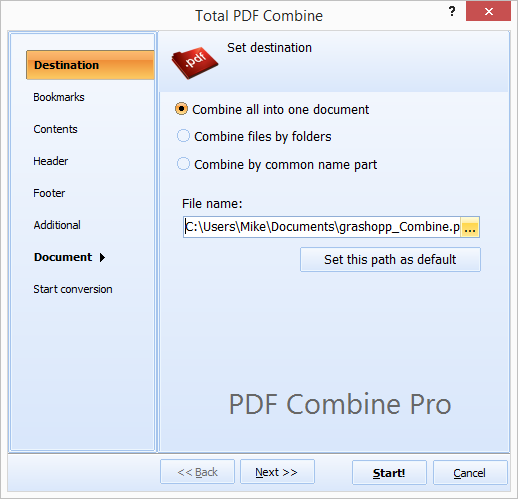 PDF Combine Pro performs conversions either via user interface or via command line. Both ways are very easy and quick, even for an inexperienced user. The program can record parameters for combining PDF files that you specify in settings wizard and then combine Word documents to one PDF file via command line. You can find detailed instructions for working with command line mode in Help menu. 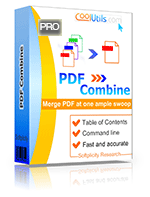 PDF Combine Pro can combine MS Word files together with Excel spreadsheets, PDF, RTF, TXT files into one single PDF document. Don’t worry that these files have different structure. Text and graphics they contain will be correctly rendered to PDF format. You can check a short video tutorial that clearly shows all advantages of using PDF Combine Pro. It demonstrates all features the program has. This powerful document combiner is available in free trial, you can download it here.